Do you sell red diesel in small quantities? 200 litre drum of premium gas oil, featuring the Gas Oil 10-Plus additive. UN approved 20 litre bag in box system, making engine and hydraulic oil readily available. UN approved 20 litre bag in box system, making kerosene readily available. 200 litre drum of premium kerosene, featuring Exocet FastFlame. Suitable for all off-road diesel engines, fitted with DPF, EGR and SCR systems including modern machines calibrated to EN590. The FuelBox features improved Cetane ratings, boosted power and reduced deposit and varnish build-up. It also improves combustion efficiency and fuel consumption, while reducing visible emissions. 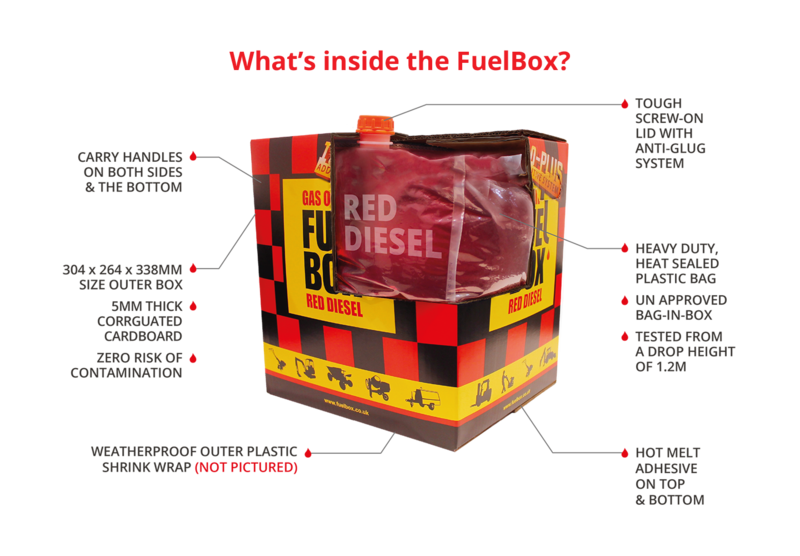 The FuelBox is suitable for all off-road diesel engines, fitted with DPF, EGR and SCR systems including modern machines calibrated to EN590.